It looks like an unidentified fish-like object to me! Hi April. The difficulty with the picture that you have used here is that it has been manipulated and rotated ninety degrees to make it look more like a fish swimming along in the sea -- see Robert Cargill's post at http://robertcargill.com/2012/03/05/if-the-evidence-doesnt-fit-photoshop-it/ for the details. yeah, unfortunately, you may be making the same mistake i did initially. it's a highly doctored photo. Aren't Tabor and Jacobovici regarded as dodgy in scholarly circles? They come up with entertainment programs for the History Channel. Which is a shame because History should be about discovering the world, learning cool stuff. Not sensationalistic programing designed to attract viewers. Sorry to be a killjoy but there it is. If turned 90 degrees, it looks like a minaret. Not sure of the fish, as it is missing fins, etc. I would need more evidence, especially given the evidence that the photo is changed/turned. Suddenly, that fact makes things very different. Thanks for your initial take April. Please see my blog for the latest (jamestabor.com). The charges of manipulation and alteration are simply false. There are no doctored photos and the "fish," no matter how it is positioned, is a fish. You are going by the book and as you know, it is positioned nose down, and you made your judgment on that. Those who have objected that a fish would not be nose down have missed the main point--the notion of Jonah being vomited on the land. Fish don't swim in tail first...again, see my latest blog post. The perfume bottle will not fly. We know what those flasks looked like in that time and culture, and even the Persian examples that Tom and others site do not look like fish. Lots of comments on the ASOR blog...I have tried to keep up but it is hard. I look forward to talking with you. Let's do a call when you can and I can also send you other images as we had planned to do back in January when you were not feeling so well. BTW, my technical report, is at http://www.bibleinterp.com/articles/tab368028.shtml. Love to hear what you think. If you would be so kind as to read my blog post on the subject, I point out that the knobs do exist on ancient pottry (unguentarium and amphorae, both are associated with funerals and burial rituals). And the 'knobby bottom' also appears on ossuaries in Rahmani's catalogue (I don't have the page number off hand by Antonio Lombattis has produced images, so his blog would be a good place to look for that). You write: "The charges of manipulation and alteration are simply false." But you have admitted the photo is a production of CGI. What is it that you think 'doctored' means? If the image is not a photograph, but a digitallly manipulated reproduction which does not match what the actual images (Fig. 20 from your report, for example) look like, then they are doctored. They are manufactured images. That is what Computer Generated means. Bob is not at all suggesting these images were products of fiction, or that there is no such ossuary, or that no iconography exists. Simply that these are not useful images because they do not accurately depict what is on the ossuary. All we have is a very heavily modified compilation of images that have been computer generated (Fig. 21) and the lone grainy picture which the iconography obscured and no orientation markers. Please take into consideration the facts here. There is no point in arguing the photos are not doctored. They clearly are. Sorry, that is what I get for using an iPhone to respond. That should read 'Antonio Lombatti' and please forgive any other grammatical or spelling typos. 'Thanks for this. I was looking for a good reference. Actually, this is fantastic and not only do I agree, I don't think it at all changes the argument. First, Taylor's may have been from the Persian period, but those I link to are from the Hellenistic and as I demonstrated they are clearly almost identical to the iconography on the ossuary. But even if it were only Persian period unguentarium, it wouldn't matter since we know from our droves and droves of sources that artists most imitated classical or ancient art. Not only does Rahmani suggest this in his explanation of the vase motif, but it is also exemplified by Figueras... so I'm not at all concerned that the iconography appears earlier on the tomb than what was circulating around the first century. I'm pretty good with digital imagery, and I trust my examination. Still, please consider my response to Dr. Tabor's claim that my research is 'false' forthcoming. According to Robert Cargill's method, his post about the digitally altered image uses digitally altered text used to express digitally altered words in order to convey a digitally altered argument. Therefore his argument is digitally altered, and should be considered false. Bob and Tom, what I have said is that none of our photos have been altered, doctored, or photoshopped in any way. They are precisely the images the camera produced taken from the hundreds of hours of video tape and freeze frames taken during the actual process. That is what is false, plus the charge/implication that we are dishonest and manipulate evidence to try to fit a theory. Nothing has been touched. There is no single photo showing the entire image, however, by moving the robotic arm in all positions the complete image is visible. In addition to the photos, to allow people to see the entire image at once, there are CGI images produced by GE Information Technologies. These are clearly labeled as such (see thejesusdiscovery.org). What I object to is your "headlining" this charge that we manipulated evidence. It is simply false. We made our analysis based on the photos, hundreds of them, and provided such to our consultants, as many as they wished. Since Discovery TV owns the images once the film comes out I am sure we can release more of them but we respect their rights, having financed this amazing and expensive effort, to handle their own intellectual property. Often images of manuscripts are not released for years--and by our SBL agreement researchers have five years before they are asked to show anyone anything. We have released what we discovered in 2010 here in early 2012. That is really quite quickly as such things go if you think back on the DSS, the gospel of Judas, and other such things. And Tom, you don't have to sent people to Antonio's blog for the images of amphora you have in mind (though I though you were a perfume flask man now), I have those in my article, which maybe you have forgotten. I was the one who first brought up the amphora possibility, as our team considered it carefully with input from our art historians (see http://www.bibleinterp.com/articles/tab368028.shtml). The fact is, none of those "knobs" look anything like this, and Taylor ended up accounting for the knob on her "perfume flask" as congealed "nard" that had dripped out? The point about the images both you and Joan Taylor posted is that they in no way resemble the unguentarium found in contemporary tombs and this motif appears on no ossuary. 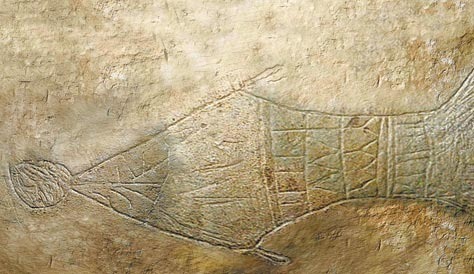 Our conclusion after studying this for two years is that the nepheh/tower is out, the amphora is at least arguable, but in the end we rejected it since all our examples of amphora are clear as they could be and this image, with its flared top/tail and other features, simply does not look like an amphora. The Jonah & the fish interpretation is the most clear and compelling--both because the image looks like a fish, not a vase, and because vases don't have stick figures and a "head" like this. What convinced us most of all was the remarkable way the artist, he or she, I like to point out, likely had no "template" to imagine and thus based this image on the text of Jonah 2 itself--even with the "temple" structure on the right, the little fish at the top, and so forth. This ossuary tells a story, from entering the "bars of Sheol" on the right end, to the Jonah image on the left panel, to the half fish image (who would draw a half vessel?) on the right side "diving" under. Anyway, thanks April for your initial take on this. I have consulted Rahmani's catalog and I am planning on putting together another blog post shortly with images. I'll keep you posted. April, I might note that Yuval Baruch, district archaeologist in Jerusalem, is supportive of our work and has been given the green light to speak for the IAA on this topic. His comments in the Hebrew version of the HaAretz story last Monday (27th) are really quite expansive--the English was considerably shortened--take a look. Anyway, Yuval, who has not been a fan of Simcha on other grounds, has said of all the ossuaries in the Bet Shemesh/Rockefeller collection (upwards of 1500 now I think--as Rahmani only goes back to 1989), with at least 350 inscribed (estimate based on Cotton, CIIP) he has never seen anything like our image, that it is definitely not a nephesh or a vessel of any time known on ossuaries. He thinks the fish/Jonah suggestion is the most convincing yet. If you actually want to understand what these symbols mean, you first need to understand ancient symbology. No one involved in this project seems to have a clue and thereby all assertions about symbols and their interpretations are without any factual support. I will demonstrate that this image purposely portrays the merger of both a fish and a vessel and it is Hebrew, not Christian. To fully understand what this image represents, it must be viewed correctly with the "ball" at the bottom, just as it was drawn. Changing its position breaks the meaning of the symbolic code. Consider that the ball is the sun rising above the horizon at the spring equinox. The fish/vessel is the constellation Pisces, and thereby this shows the spring equinox sun, rising into Pisces, which is how you determine the current age on the zodiac. The bottom of that fish image plus the two handles is a very good rendition of the actual shape of the constellation Pisces. This image would then represent a zodiacal/astrological time stamp pointing to the second temple period, which was at the start of the age of Pisces. The fish thereby represents the constellation Pisces, and the vessel shape holds the "waters" of that age. Water symbolizes the flow of deeds through time, and a vessel holds a measured quantity of water (or other liquids like wine and oil). The measured period of time is the 2160 years of the age of Pisces, which ended in 2001. This image is a perfect symbolic code for the age of Pisces and the time and deeds (waters...) it represents. The vessel aspect matches the symbolism of the next age, which is Aquarius, the water bearer. Thereby, this image merges two zodiac ages, the previous and the current. It also perfectly matches the astrological time-codes long hidden in the symbolism of Revelation, which encodes a period of time stretching from the second temple period until now using stars, angels, and seals as its codes. The second temple period was the 11th 360-year cycle on the Hebrew calendar. That is why the Dead Sea Scrolls were buried in exactly 11 caves, during the 11th cycle, which is also symbolized by the 11 stars in Genesis. The 11th cycle was also the beginning of the age of Pisces, and it is well known that the zodiac was used by those who buried the Dead Sea Scrolls, as well as other groups throughout the region. The symbology of that image is not Christian, but instead a symbolic time code pointing to the ages of Pisces ( time of burial) and Aquarius (now) and related details. That is also the true source of the fish symbolism used by early Christians and later recast by Church leaders to hide the astrological source and associations with those most call the “Essenes.” Visit my website (SevenStarHand.org) and download a free copy of my ebook to learn the basic rules for this ancient symbology. They prove all previous interpretations are erroneous, though both a fish and a vessel were correct guesses. This image provides key proof that Christian assertions about the fish and related symbology have always been wrong. I’ll publish more details soon. Hi.,It was Wonderful article.I really appreciate for this Great article.But that picture looks like a pen nib for me.you people done wonderful effects here.